Description: The U.S.S. North Carolina is a decommissioned World War II battleship, permanently moored as a memorial and historic site in Wilmington on the Cape Fear River. The ship weights 36,000 tons and is 728 feet in length. The retired battleship serves as commemoration of the heroism of U.S. sailors and soldiers from North Carolina in World War II. A bronze plaque on the hull of the bow bears the textual commemoration in raised lettering. IN MEMORIUM / THE U.S.S. NORTH CAROLINA / BATTLESHIP MEMORIAL COMMEMORATES / THE HEROIC PARTICIPATION OF THE / MEN AND WOMEN OF NORTH CAROLINA / IN THE PROSECUTION AND VICTORY / OF THE SECOND WORLD WAR, AND / PERPETUATES THE MEMORY OF THE / MORE THAN TEN THOUSAND NORTH / CAROLINIANS WHO GAVE THEIR LIVES / IN THAT WAR. Unveiling & Dedication: The U.S.S. North Carolina Battleship Memorial was dedicated on April 29th, 1962. Admiral Arleigh A. Burke gave the dedication speech honoring veterans of World War II and the many men and women of North Carolina who gave their lives in service during the war. Thousands of people boarded the battleship to hear the dedication while many more looked on from land. North Carolina Governor Terry Sanford spoke, as well as Secretary of Commerce Luther H. Hodges and former Governor Admiral Claude V. Ricketts. Hugh Morton was praised during the dedication for his role in bringing about the "homecoming" of the battleship. Governor Sanford summed up the momentous occasion by vowing, "I pledge to you today'_ that no stone will be left unturned to the end that this will be the greatest World War II memorial in the United States." Post dedication use: The U.S.S. North Carolina now serves as a floating museum. It was declared a National Historic Landmark in 1986. Subject notes: The U.S.S. North Carolina was decommissioned in 1947 after her participation in every major operation in the Pacific theater in World War II and after earning 15 battle stars. Following purchase of the ship from the federal government after the successful raising of $330,000 for the sale, site preparation, and travel to North Carolina, the ship was handed over to the North Carolina Commission in a ceremony at Bayonne, New Jersey on September 14, 1961. Controversies: During the ship's navigation up the Cape Fear River to its final resting place, it struck the Fergus Ark Restaurant, a floating Wilmington restaurant. The Restaurant was badly damaged and had to close permanently. The battleship has also been rumored to be haunted. Location: The U.S.S. 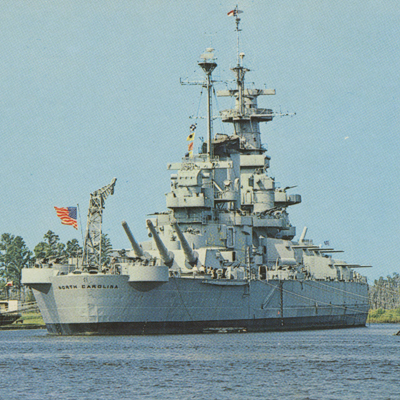 North Carolina sits in the Cape Fear River alongside the Battleship Park. Former Locations: The U.S.S. North Carolina was built in New York, with the keel being laid in 1937, and traveled to California, Japan, and the Panama Canal, as well as locations in the Caribbean and the Pacific, before coming to North Carolina. Before being relocated to Wilmington, the ship was moored in Bayonne, New Jersey where it was berthed with the U.S. Navy Reserve Fleet following its decommissioning and subsquent wait to be turned into scrap. Landscape: The ship sits in a prepared site on the river, with a fixed ramp for access and an interpretive building adjacent on land.